AGONAsport presents the site’s inaugural Greek Super League End-of-Season Awards. The 2017/18 championship will remembered as the season that AEK won the title after nearly a quarter century. PAOK came up just short due to two points deductions, while Olympiacos suffered a swift fall from grace after winning the last seven league crowns. AGONAsport runs through the best of what the league had to offer this season, both on the team and individual level. Our site contributors have weighed in to select their picks for who truly shined this season in the Greek Super League. Here are a list of our 2017/18 Greek Super League Awards winners along with honorable mentions. Do you agree? Disagree? Are we on spot on? Or did our picks fail to find the target? Have your say on Facebook, Twitter, and Instagram. It just has to be the Kitrinomavri doesn’t it? After 24 long years without a title win, Manolo Jimenez’s men finally found their way back to the top of Greek football this season. With a miserly backline that gave up only 12 goals and quality across the attacking positions, AEK were solid throughout the season and spectacular when they needed to be. They say the title is won against the smaller sides, but the difference for AEK was perhaps in claiming some massive derby victories. Two comeback wins over Olympiacos may have been what brought AEK their elusive championship, but just as important was a double over their direct rivals for the title, PAOK. In Thessaloniki there is still head-shaking over how PAOK lost the league. Many claim the club were treated unjustly due to points deductions in the home matches against Olympiacos and AEK. That is a debate that will stretch one for years undoubtedly. What can be agreed upon is that Razvan Lucescu’s side were superb this season, a well-balanced side that was the best PAOK team in the last few years. The Peristeriotes came out of nowhere to claim fourth place in a fine season under first-year manager Damir Canadi. In 2016/17 the team finished eighth, 13 points behind the European spots. This year was a completely different story. Atromitos started well early on and was always in the mix for a place in Europe, at one point even amidst the title discussion. Canadi put together a defensively strong team which included some very creative attacking players such as Amr Warda, Nicolas Diguiny, Abiola Dauda, and Theodoros Vasilakakis amongst others. The result was a best-ever finish in the top-flight and a team that was fun to watch. A year ago, Asteras had just weathered a relegation battle that saw them finish just above the drop zone. Now, the club prepare for a return to European football this summer when the new season begins. The architect of this fantastic turnaround is none other than Savvas Pantelidis. Appointed three matches into the season after the sacking of Staikos Vergetis, Pantelidis took over a side with a only a single point and slowly led them up the table. The Tripoli side peaked when they had to, finishing the season with only one defeat in their last eight matches to finish above Xanthi on goal difference for the final European berth. There were players with more goals, assists, minutes played and better statistics in general, however Christodoulopoulos had more impact on his team than any other player in the league. The 31-year-old rarely played the entire 90 minutes this season, but he made the difference in several matches with his timely goals and streaking runs down the flanks. When you get right down to it, AEK had some very good attacking talent in the form of Marko Livaja, Sergio Araujo, and Tasos Bakasetas. What they needed was a talisman. And in Lazaros this season that is what they got. The Greek international provided the moments of brilliance that ultimately helped swing the title in AEK’s direction. Atromitos seemed to go as Warda did this season, a campaign of vindication for the Egyptian playmaker. Having lost his way at PAOK, Warda could have easily sulked through this season when sent to Atromitos. Instead, he lived up to his potential as an incredibly creative and skillful attacker. Warda’s eight goals and seven assists only tell part of the story as he provided real leadership on the pitch for his side. With a World Cup coming soon and the prospect of getting another chance with PAOK, the 24-year-old could be coming into the best part of his career in the next few seasons. There were worthy competitors in Manolo Jimenez and Marinos Ouzounidis, but this year’s pick is Atromitos’ Damir Canadi. A relative unknown in Greece, the journeyman manager eventually showed his worth in leading Atromitos to their best ever Super League finish. Along the way, the 48-year-old was able to put together a side that was resolute defensively, but also able to play attractive football. Atromitos were near the top of the table all season, Canadi leading them to consistent results. He will be one to watch next year as to whether he can continue to improve the Peristeri side. Close behind Canadi is Jimenez. The Spaniard led AEK to their first title in 24 years by putting together an extremely solid backline and allowing his creative players the freedom to play their game. The 20-year-old took advantage of injuries to propel himself into the AEK line-up this season. Galanopoulos appeared in 19 Super League matches, doing good work for his club in his defensive midfield position. His steady, assured displays earned him a call-up to the Greek national side. 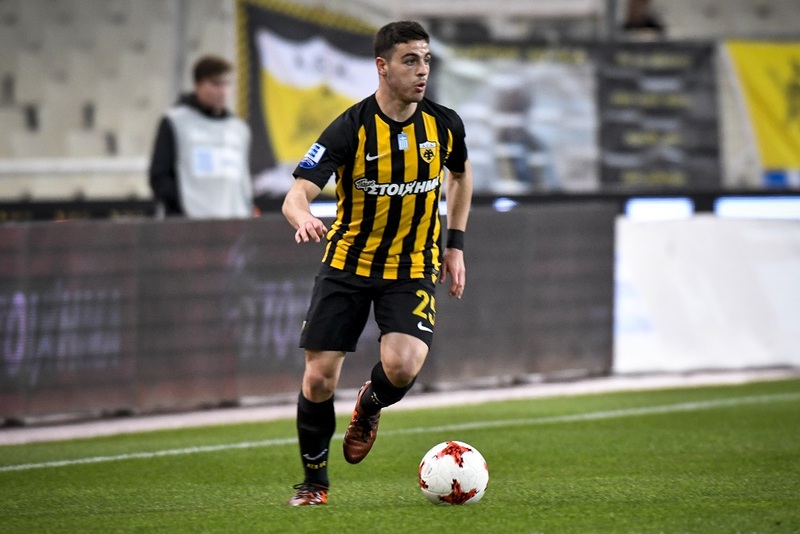 Galanopoulos is already showing his worth for AEK and will be a player to watch for years to come if he can continue to develop. With all due respect to Galanopoulos, Mavropanos would probably have been top of the list had he not made his incredible move to Arsenal. The young center-back has shown at the Emirates all the qualities that observers had pointed out while he was with Giannina. Mavropanos began the season in stunning form, not only proving to be a rock at the back, but chipping in with some goals as well. Perhaps the most important match of the 2017/18 Greek Super League season was also the best. On Matchday 5, AEK welcomed Olympiacos to the Olympic Stadium in Athens. It already seemed like these two sides would be battling it out for the title when they met in late September. Defending champions Olympiacos struck first blood through a delightful chip from Marko Marin on 22 minutes. Just after halftime, Vadis Odjidja-Ofoe made it 2-0 for the visitors. AEK pulled one back through Lazaros Christodoulopoulos just after the hour mark. Then Christodoulopoulos conjured up a moment of sheer genius with ten minutes left as he scored an unbelievable goal with a viciously swerving free-kick from 30 yards out. The scene was set for Petros Mantalos to slide home from close range in the final of the game. AEK fans were jubilant, Olympiacos supporters crushed, but for the neutral it was a pulsating 90 minutes of football showcasing the potential of the Greek game. What a match in Tripoli back in March. Djalma Campos’ tap-in cancelled out Giorgos Kyriakopoulos’ goal as the two sides went into halftime tied 1-1. Martin Tonso gave Asteras the lead shortly after the break. That looked like how it was going to finish as the game went deep into injury-time, but a hopeful long ball into the Asteras box saw Walter Iglesias foul Aleksandar Prijovic. The ensuing penalty was just converted by Prijovic to make it 2-2 in the 97th minute. There was just enough time for one final act though. Asteras stole the ball at midfield and quickly countered and Iglesias went from goat to hero as his left-footed shot took a deflection en route to goal to make it 3-2 in the 98th minute and give Asteras a famous win. A free-kick. 30 plus yards out. Power. Swerving. Knuckling. Top corner. Tying the match 2-2. You can’t say much more to describe this amazing strike. Just watch it again. Take your pick of one of two goals in an epic brace scored by the Atromitos player. Vasilakakis’ first goal was a fabulous bicycle-kick from 12 yards. The next was not as aesthetically spectacular as far as acrobatics go, but just as brilliant in football terms as he unleashed a perfectly hit full volley into the top corner from outside the box. Two simply amazing goals from a player who is making a name for himself with the unbelievable goals he scores. Our pick for MVP is also our selection for best Greek player of the season. Christodoulopoulos’ knack for the big occasion and his propensity to pop up when it matters most to help his side are the traits that see him edge out some worthy contenders. This was the season where Pelkas really became an integral part of the PAOK team. While the glimpses of skill and talent were there to see in years past, this season there was substance and consistency to the young attacker’s game. At 24, there is the hope now that Pelkas can use this season as a springboard, both to become a leader for PAOK and to produce for the national team. Mohamed Salah was sensational winning honors in the Premier League, but in Greece it was all about his compatriot Amr Warda. Atromitos had a decent squad, capable of doing well this season before Warda, but his loan move from PAOK made all the difference. Warda was a constant providers of goals, assists, and killer passes that helped propel Atromitos to a top four spot. The league’s leading scorer, Prijovic was simply on fire all season long. HIs 19 goals are a testament to his finishing ability, but played the role of target forward to perfection. It will be a real coup for PAOK if they manage to hold on to this player who has proven himself to be such a prolific marksman in Greece.